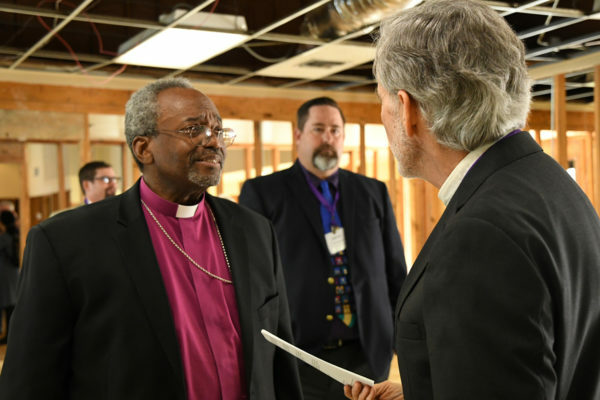 [Episcopal Diocese of Texas] During Presiding Bishop Michael Curry’s visit to the Diocese of Texas Jan. 30-31, clergy and church members shared stories of Hurricane Harvey’s epic flooding and aftermath. In some places, Harvey dropped more than 50 inches of rain in four days last August, and its impact was felt across 41 counties and a half million homes, with damages estimated at more than $190 billion. The storm that caused such historic flooding seemed hard to imagine this week in Houston as clear skies and mild temperatures greeted the presiding bishop and his team. Curry was joined by Sharon Jones, his executive coordinator; Episcopal Relief & Development Senior Vice President for Programs Abigail Nelson; and Geoffrey Smith, chief operating officer of the Episcopal Church. 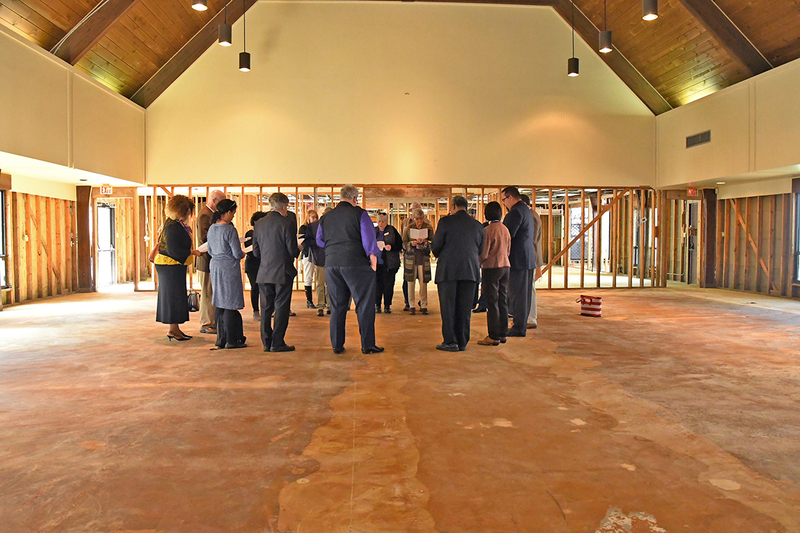 Once the debris is hauled away, things can seem pretty normal, until one walks into the nave of a church, looks through the studs to classrooms, offices and the parish hall beyond and has to be careful to avoid tripping over large bolts in the bare concrete floor that once secured the altar railing. Five months after Harvey, in many churches and thousands of homes there remains the odor of floodwaters, and mold still seeks a foothold. 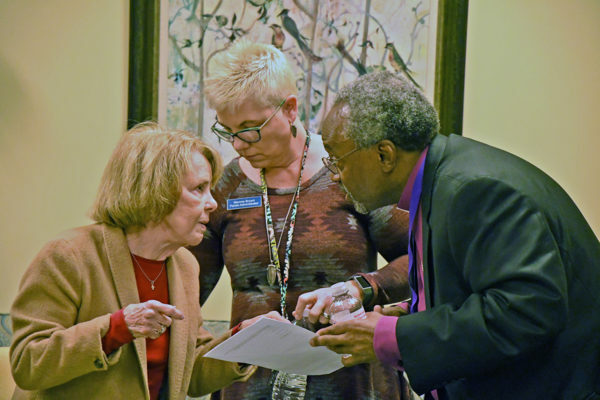 Episcopal Health Foundation made an early decision to deploy its resources into research, President and CEO Elena Marks told Curry at an early morning briefing on Jan. 30. The Health Foundation partnered with the Kaiser Foundation to survey the area affected by Harvey and map the storm’s impact to show where damage was concentrated and who was most affected. “It’s not just research and maps,’’ Marks emphasized. “We wanted to engage communities and are making presentations to groups doing relief work with the hope that they will use data to set their priorities.” The resulting maps and research already have been accessed more than 30,000 times. The research reveals some things that deserve a closer look. Shao-Chee Sim, vice president of applied research at the Episcopal Health Foundation, said of the 900,000 relief applications filed with Federal Emergency Management Agency, or FEMA, the approval rate for homeowners was 45 percent, while it was 36 percent for renters. In the upscale Memorial area of west Houston, 66 percent of the 2000 applications filed had been approved. Diocese of Texas Bishop Andy Doyle said the data will help Episcopalians and others provide a different kind of disaster response. “We want to leverage the research to help the most vulnerable, to have a long-term effect within these communities,” he said. East of Houston, the area of Beaumont, Orange and Port Arthur — known as the Golden Triangle — received more than 60 inches of rain during Harvey. Curry heard from the Rev. Keith Giblin, a federal judge and bi-vocational Episcopal priest, who serves St. Paul’s in Orange, where 86 percent of the homes were affected. Cut off from his congregation during the storm, Giblin navigated drainage ditches in Beaumont to rescue people in his aluminum fishing boat. He was among thousands of citizens who joined first responders to spend days and nights searching for people trapped in sometimes neck-deep water. “We had to drag the boats in places because the water could be 13 inches deep, sometimes four feet deep,” Giblin said. Submerged cars, floating clumps of fire ants, downed power lines and water moccasins plagued those who used boats, kayaks and pool floats to rescue victims. St. Stephen’s rector, the Rev. Stephen Balke, thanked Curry for the video he recorded after the storm to offer prayers and support. “We gathered to worship and put your video up. I can’t tell you how much that rallied our spirits,” he said. The congregation helped the more than two dozen parishioners whose homes were flooded and cooked for the entire community for weeks. The Rev. Lacy Largent, in charge of spiritual care teams, emphasized that support from elsewhere was critical. She gave the example of Kate Hello, a teacher in Lemay, Missouri, who sent letters from her students. The process of rebuilding was compared to a marathon rather than a sprint, and Curry affirmed the Episcopal Church’s long-term support. “We are long-distance runners,” he said. During a stop at Trinity, Baytown, the presiding bishop heard from Senior Warden Robert Jordan and one couple he rescued. “I was in the water for five days doing search and rescue,” Jordan told Curry. He happened to be near church members Duane and Lois Luallin’s home of 40 years, when he learned the elderly couple needed help. Duane had fallen and was unable to get up, and 911 responders were overwhelmed. Jordan arrived in five minutes and ferried the Luallins to safety. He had them dry out and eat at his home, where they stayed for nearly a month before moving to an apartment. Trinity also fed first responders breakfast and provided food at all hours for anyone who was hungry. “Bishop Curry, you can be encouraged that the Jesus Movement is alive at Trinity,” said the Rev. Micki Rios, Trinity’s deacon. During the visit to Texas, Curry and his team also met with Hispanic clergy from the Iglesia Episcopal San Mateo in southwest Houston. The Rev. Janssen Gutiérrez, rector of San Mateo, had just begun his new job when Harvey took out four of the campus’s six buildings. The congregation of 300 to 400 worshipped in tents for two months and actually saw an increase in their numbers, Gutiérrez said. Curry thanked church members who had prepared a large breakfast of pupusas, plantains and homemade red beans on the second morning of his visit. He reminded them that Jesus always fed people before he would teach them. 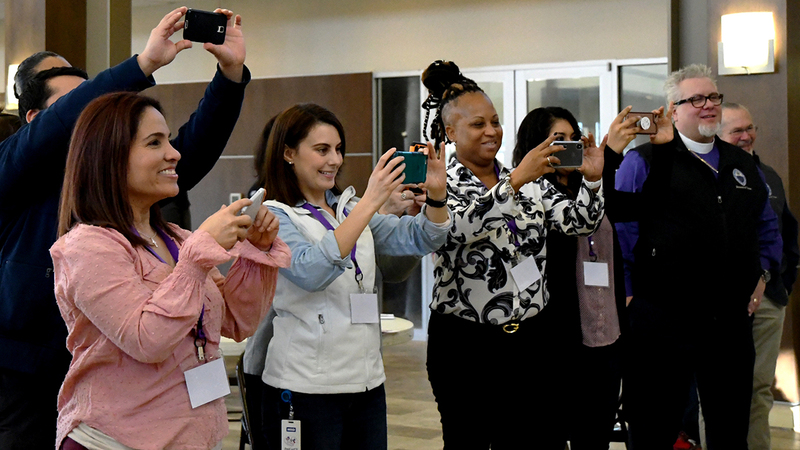 Curry also toured St. Thomas’ Episcopal Church in southwest Houston where the group was entertained briefly by several bagpipe students practicing in the courtyard. The church and school of 600 students were hit hard by flood waters for the third time in two years. Much of the school will be rebuilt as a result. The group concluded its tour of affected areas at Emmanuel Church, hosted by the rector, the Rev. Andy Parker. Emmanuel’s buildings are bare after the campus flooded when water from the reservoirs was released in the days after Harvey. Everything has been taken down to the studs, and the exterior will also be replaced. Emmanuel’s congregation continues to worship at nearby Temple Sinai where the sacredness of placing a temporary altar over the bema, from where to Torah is read, is not lost on anyone. 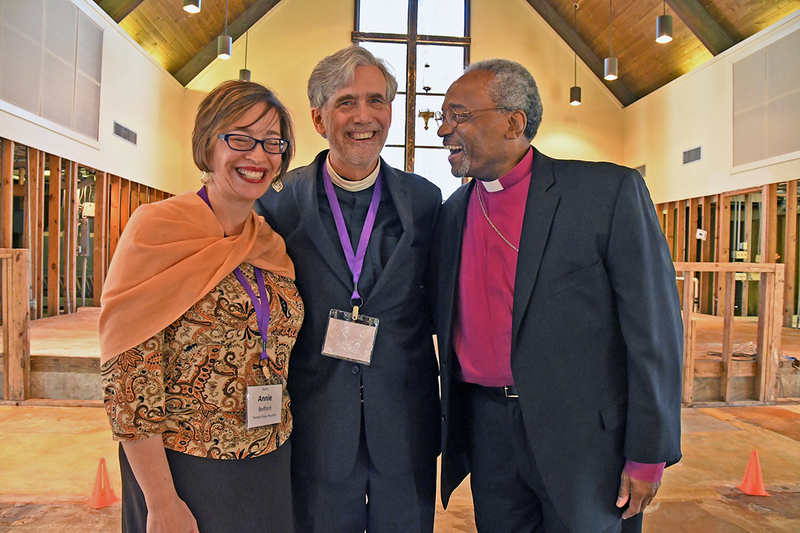 The presiding bishop asked all of the people with whom he met what they wanted to tell fellow Episcopalians. To a person, everyone acknowledged that receiving prayers and support from others had kept them going. Lance Ferguson, newly elected senior warden at Emmanuel, said, “We’ve had help from around the world. We didn’t do it alone, and that’s been an eye-opener for people here. You can get through anything if you know you have support,” he said. Surveys done by Episcopal Relief & Development after Harvey showed that in just a few months, and with the financial support and supplies from Episcopalians throughout the country and the world, the Episcopal Church in the Diocese of Texas had served more than 90,000 people affected by the storm. Curry spoke encouraging words to the group gathered for worship at Emmanuel. “You, we, are not alone, even if it feels like it sometimes,” Curry said. “We were made for God and each other, and even in midst of hell there can be glimpses of heaven when we are not alone,” he said, noting the many times neighbors have come to the aid of neighbors during and after the waters of Harvey. Going forward, the church’s mission will pivot to restoration and rebuilding, and that will take much support, from Episcopal churches in the Diocese of Texas and beyond. The Rev. Stacy Stringer has been named director of hurricane recovery to oversee regional centers in the affected areas that will help coordinate rebuilding efforts, which are estimated to take two to three years. – Carol Barnwell is director of communications for the Episcopal Diocese of Texas.